THE CITIZEN ROSEBUD: A Thing for Spring? Bursting with Blossom: Spring makes for seriously fun dress ups attempts. Spring is my favorite season, especially this time of year. I pull all my floral frocks out, and pretty much layer on whatever springtime folly I can think of- usually in the form of a ridiculous hat. By which I mean a vintage (usually floral) one. I'm not sure why, other than it's FUN. Which you'd never guess by how seriously serious I am in these photos. I swear to blog, I wasn't meaning to mad dog the camera. Why so angry, little fashion blogger? Somebody steal your pose? SERIOUSLY. Who am I glowering at here? LMAO! Here lies the down side of taking your own photos, which is an act of the absurd in itself. You sometimes forget to look like you were having fun. Good to know that I've got my "Fierce Face" down pat. Gonna come in handy, uh, someday, I'm sure. Maybe I was all super serious because I was intially posing to sell the items, and by the end of it, decided to keep the outfit. I probably thought YOU were all up in my stuff and wanted to borrow the frock and coat for your own #shameless #selfie photo shoot. Who knows? But I'm laughing now at my mad, mad, mad(dog) modelling skillz. The outfit is all secondhand sourced, except for the socks- which I've been wearing for a few years now, so they sort of count as a #SHF item. The dress was bought from Value Village for under $12, and it looked brand new, a designer find by Colors by Benneton. Fits me to a T, too, which says something, as I struggle constantly with my short but thick waist and long torso. The jacket was a splurge, I paid $20 for it at my local Goodwill, which has crazy HIGH prices for a "charity" thrift store. It too was brand new and previously unworn. I've had it for a couple of years, but only just recently really saw its true potential in my Seattle based adventures. 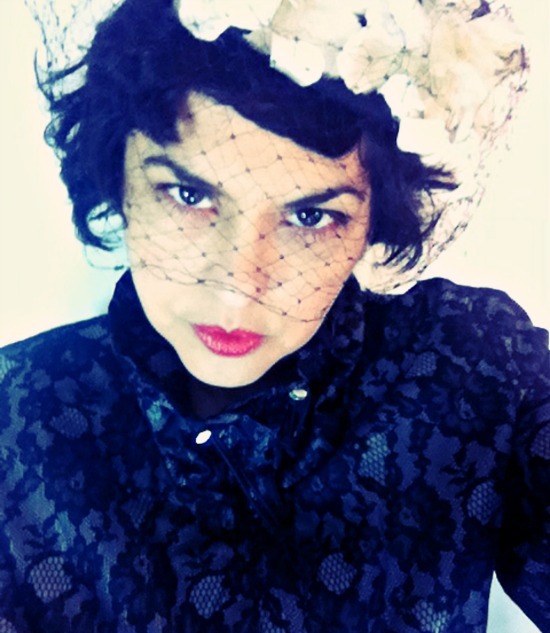 It's a plastic rain jacket but the black lace texture adds a bit of poetry to its practical applications. 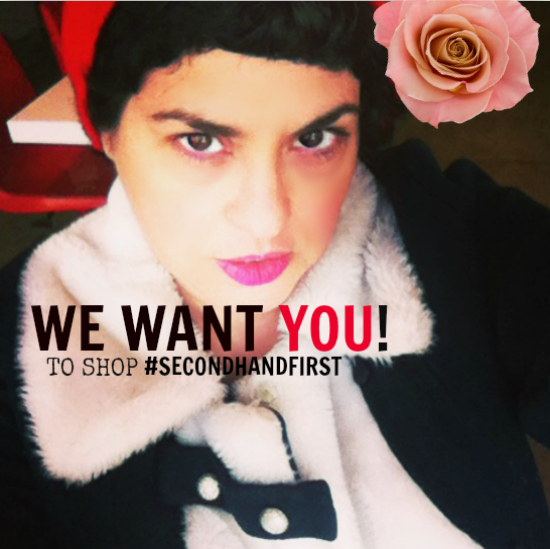 REMINDER: Tomorrow is the link-up for your #SECONDHANDFIRST finds! Starting in 8 am on Friday and lasting for one week, we're hosting a party featuring your best thrift store scores, Etsy bought, ethically made, eco and up-cycled goodies. Just link your photo or post, and leave a comment. We'd love to hear what you're doing to make better sustainable shopping choices. Hey! In real life, I am SMILING! It's Spring and things are about to get good! FOR SERIOUS. Thanks for being good sports, and true pals. See ya on the flip side. Super cute-- loving the knee socks. I love your fierce look! Rar! Love it! Fierce and flowery. That coat is right on trend with all of the lace right now. You are one of the very few people that can pull off such a fantastic hat. Crap...I need to take some photos of my latest consignment finds. You are a rockstar ! Loving it ! I think your pics are wonderful .. I thought you had that super model pouty thing goin' on. dear lady, you're blooming madly! !, and love your fabulousness! 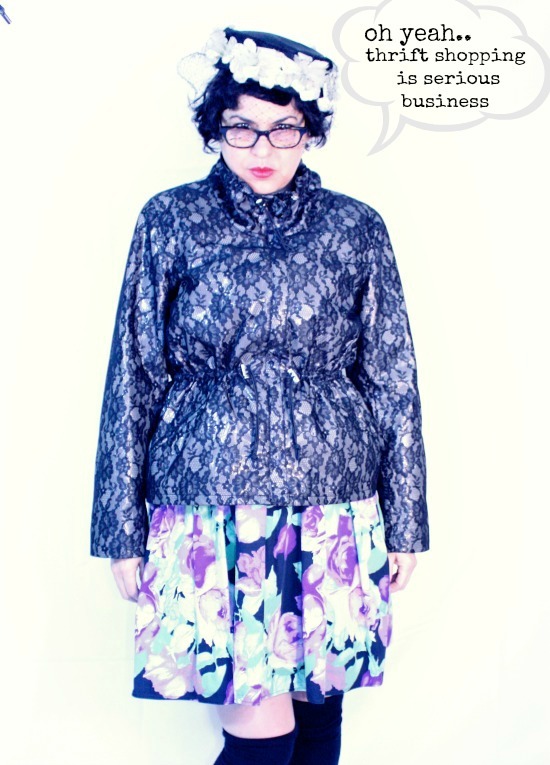 !, posing like a killer fashion blogger!, showing your floral dress and lace fabulous jacket! !, and your Hat is Perfect!! It's hard to take our own photos. Nature didn't intend for us to be both model and photographer. Maybe I could take your pictures and you could take mine?! You my dear Bella … so so fabulous! Love that jacket! The lace pattern almost makes it like Op Art. I'm learning that I can't do a "cool" look on camera - it just looks mean or bored. But if I smile too much I look goofy, or my gold molars show! As the timer ticks down I try to remind myself how silly it is to take selfies, and that usually gives me a wry smile.